1. Don’t start what you can’t finish. This is the first rule of prospecting. Too many people think if all they do is send out a bunch of emails or make a bunch of phone calls, prospects will suddenly appear. Key is to never put more into your pipeline than you support with the right amount of follow up. 2. Develop who your perfect customer would be and then focus all of your time toward attracting only those people. The most valuable resource you have is your time and you can’t afford to waste it by spending time with anyone who does not fit the criteria of your perfect customer. 3. Use multiple methods to reach your prospects. It can be easy to be sucked into thinking the only thing you need to be doing is sending out hundreds of emails each day or just pushing out as much content as you can on social media. To reach your prospects, you need to reach them the way they want to be reached. This means using what you feel is best may very well not be what they prefer. The best prospectors use all methods available, including the telephone and voicemail. 4. Have a dedicated time to prospect each day or week. If it’s not on your calendar, it can be far too easy to become focused on other things and not make the time to prospect. The worst case of this is when you allow your time to be consumed with existing customers. Failing to make time to prospect on a daily or minimally weekly basis is a sure way to find yourself with an empty sales pipeline. 5. All of your prospecting effort must be focused on the customer, not on you. The prospect doesn’t care about you. They care about their own problems. Thinking your information needs to be telling prospects how great you are won’t get you anywhere. Focus on sharing insights, questions, etc. that will highlight what is important to the prospect. If you allow the prospect who rejects you to get the best of you, you’ll quickly become defeated. A “no” is only a moment in time. Never view it as permanent, and instead view it as their loss, not yours. 7. Focus your emotions on helping others. Yes, the process you use to sell is important and yes, what you sell is important, but even more important than both of those is why you sell. You sell because you firmly believe you can help others. If you don’t believe 100% in how you can help others, you’ll find yourself never being able to achieve a high level of success. 8. Repeat, repeat, and repeat. Have you ever noticed why you see the same ad numerous times? There’s a reason why big corporations will repeat the same ad over and over. They know they need to repeat it to create the level of response they desire. The same goes for your prospecting process. You need be willing to reach the same prospect 5 or even 10 times to get them to respond. Key is each message must be different. Advertisers can get away with the same ad, but you can’t get away with the same message. Make each one different to allow you to be seen as communicating value for the prospect. 9. Be concise in everything you do. It can be tempting to send out messages that are nothing more than massive data dumps. Data dumps are not read. They’re ignored! Make all of your messaging short, concise and based on a single call to action. If you want to break through, whether it be a phone call, voicemail, or email, the more concise you can make it, the more you’ll be seen as a person who values the prospect’s time. 10. Your success with prospecting more than anything else is going to be driven by your attitude and willingness to be persistent and not give up. Prospecting is what separates the great salespeople from everyone else, and it comes down to the desire to succeed where others fail. When others say it’s time to quit, the top performers says there’s time to make one more call. 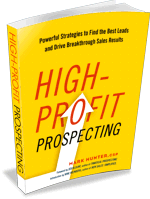 Prospecting is not about having the biggest sales funnel. Never allow yourself to believe a huge pipeline is vital. Your goal is not to have the most prospects. Your goal is to have the best prospects you can close. Don’t Forget: I am doing a FREE WEBINAR this Thursday on what it takes to turn Prospects into Customers! Sign up today at this link! PrevPreviousSales Motivation Video: Is Your Energy Infectious?